As we make our way through the first quarter of 2018, we can look back and say one thing for sure, the last year has been a year that we won’t soon forget! 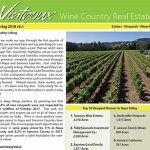 This newsletter highlights values over the last two decades and identifies interesting trends for premium vineyards and prime areas throughout Napa and Sonoma Counties. First and foremost, quality is king. Whether it is Napa Valley Cabernet Sauvignon or Sonoma Coast Pinot Noir, quality is the undisputed driver of prices. Like many things these days, the value cycle continues marching forward. Natural events, stock market, politics… it’s been one big blur. Fortunately for us, wine country is an excellent place to watch it play out. Let’s keep things positive by pointing out that 99.8% of area vineyards were not impacted by the wildfires of October 2017. That said, our thoughts and prayers go out to all of those who were not so lucky. There is more positive news. Grape prices in Napa and Sonoma Counties have increased. The annual grape crush report notes an increase in wine grape prices by 11% in Napa County and 8.2% in Sonoma County in 2017. 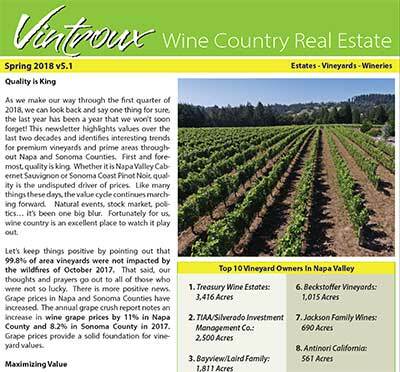 Grape prices provide a solid foundation for vineyard values. With respect to vineyards, maximum value comes from combining the most desirable appellations with the most desirable varietals for the particular area. In Napa County that means ultra premium quality Cabernet Sauvignon planted in areas like Rutherford, Oakville, Howell Mountain and other prime regions. 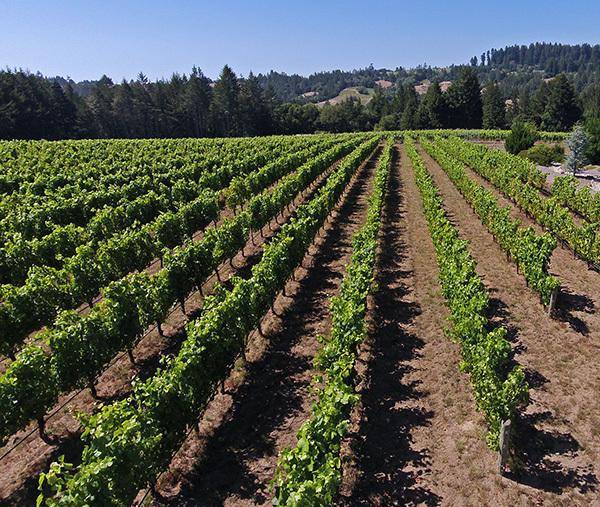 In Sonoma County that means Pinot Noir in the Sonoma Coast and Russian River appellations. These combinations command the highest prices leading the way to increased values for our entire region. Quality matters. The same principle is true when discussing Chardonnay, Sauv Blanc, Zinfandel, Syrah or other varietals. In other words, if you have old vine Zinfandel in Dry Creek Valley, premium Chardonnay in Los Carneros, or cult quality Cabernet Sauvignon in Alexander Valley the same rule applies, quality is king when maximizing value. Aside from some of the macro elements that impact value, one variable has become much more dominant…. scarcity: the lack of more quality land to plant. For all intents and purposes, Napa County is planted out… and has been for quite some time. In Sonoma County, quality plantable land is becoming much more limited. It is not far-fetched to point to scarcity as a value driver in a world-class wine-growing region. Lacking ground to plant, existing vineyards become more desirable… and you guessed it, more valuable. Scarcity can also be a potential hedge / insurance policy against macro economic downturns. As mentioned previously, Napa County has been effectively planted out for years. Reviewing the chart illustrates that the highest end vineyards and regions in Napa County essentially flattened out during recent economic downturns, including the Great Recession, while other regions were pummeled. In Sonoma County values for the highest end vineyards have had a different pattern filled with peaks, troughs and recoveries as a result of economic turmoil. 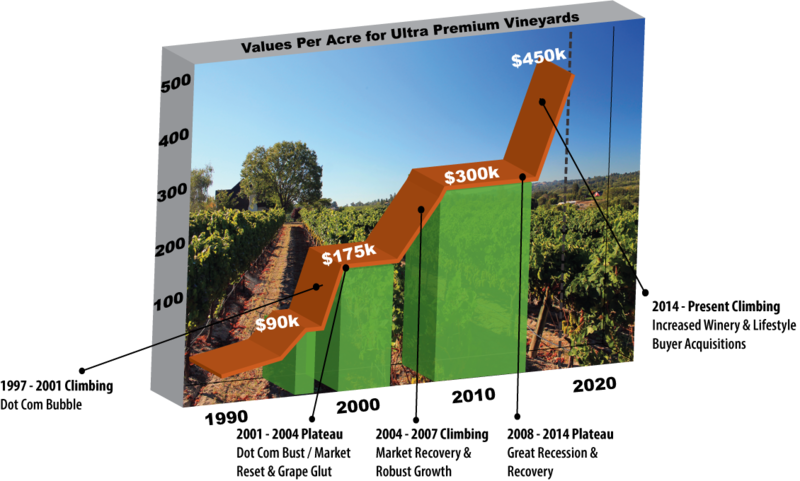 A question in my mind is whether the ultra premium vineyards in Sonoma County have recently entered the scarcity hedge plateau status of their neighbors in Napa County. I suppose we will find out eventually. When naysayers comment on the prices of our prized vineyards, I point to Bordeaux and Burgundy where vineyards come at a much higher premium. Putting things in perspective and using other world-class grape growing regions as a guide, we have plenty of room to appreciate. Either way, it is my view that quality land and vineyards are only going to continue their upward trend over time. 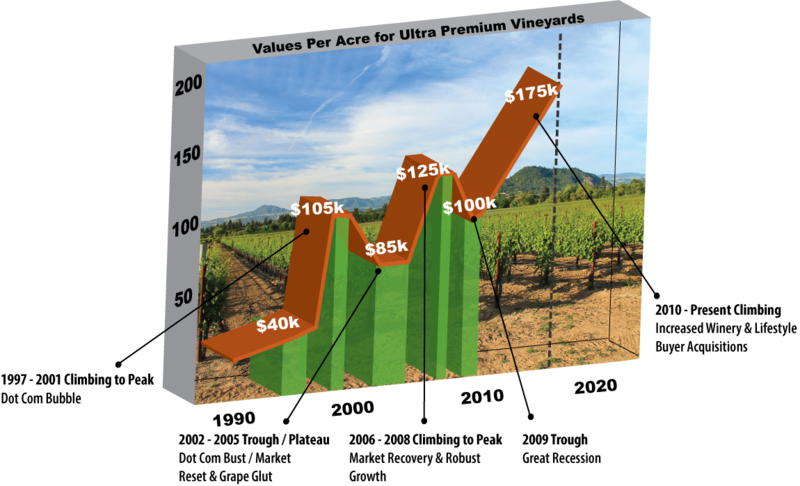 Currently vineyard values range from $150k – $450k / acre in Napa Valley and from $90k – $175k / acre in Sonoma County. There is a wide range but it all comes back to condition, location and quality. As they say, the only thing certain in life is death and taxes. For now, let’s focus on taxes. A big question is how the new tax law is going to affect California? Looking into the crystal ball, the answer is we don’t know for sure. What we do know is that California is the greatest economic engine in the country and buyers still want to live and work in the Golden State. We also know that our legislators are looking into creative solutions to reduce the burden of this new law. Despite this and other challenges wine country is still one of the most desirable places to live, work, and produce world-class wine grapes. People will still want to invest in Napa and Sonoma Counties. The future is bright.